Epimedium x perralchicum photos : Epimedium 'Frohnleiten' for my records. Nice young foliage. You can visit our Epimedium x perralchicum page or browse the pictures using the next and previous links. 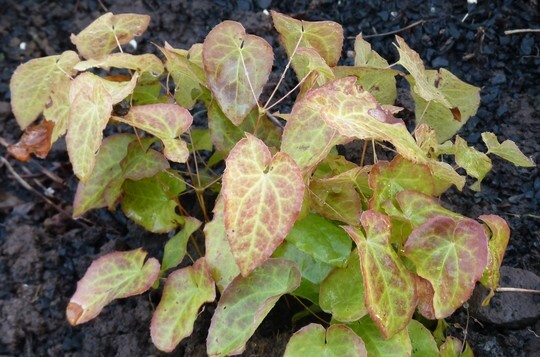 If you've been inspired take a look at the Epimedium plants in our garden centre. Epimedium 'Frohnleiten' for my records. Nice young foliage. Planted in the golden border as it will have lovely bright yellow flowers. Yes, I like these....they have interesting leaves! Yes Angela, I just did my white flowered one in the back garden. I shall leav this one for this year and start cutting it back next spring. I don't know if there will be flowers this spring anyway, it might not flower in its first season. Thanks Paul, they do! They are early! I was looking at my yellow flowered one today wondering if it was time to cut the old leaves off but there was no sign of the new ones yet. I cut my leaves off during the 1st couple of weeks in Feb, otherwise can't see the flowers, have 3 different Epimediums. Last year the flowers stood up above the leaves. They would probably look better without the leaves - but they are so fresh and healthy looking it seems a shame to cut them off. Perhaps its time to look if any flowers are shooting up now the weather is improving. I only cut off the previous year's leaves, which enables lovely fresh leaves, like Karen's to show their beauty. Those are the ones I meant - still looking good.No sign of new leaves of flowerbuds on the yellow one, but just noticed flower buds on the white one so will give the leaves on that one a chop. See who else is growing Epimedium x perralchicum (Barrenwort).